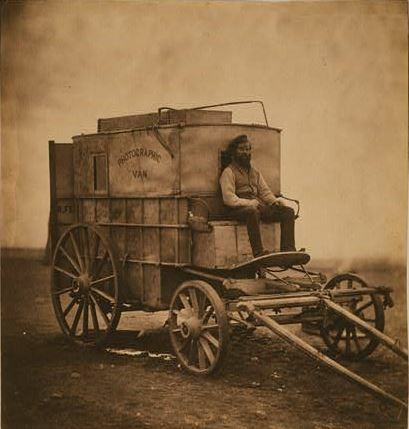 I’ve always been transfixed by the Crimean War images created by the photographer Roger Fenton. 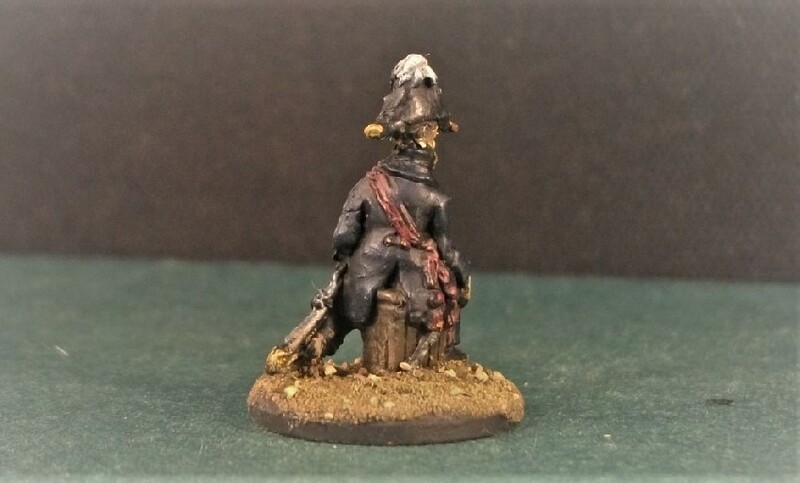 The soldiers he depicted were, in many ways, identical to the kind of soldier seen on Napoleonic battlefields 40 years before. This was the twilight era for the kind of brightly-coloured uniforms seen on campaign since the beginning of the 18th century and it was being captured for posterity by the new science of photography. 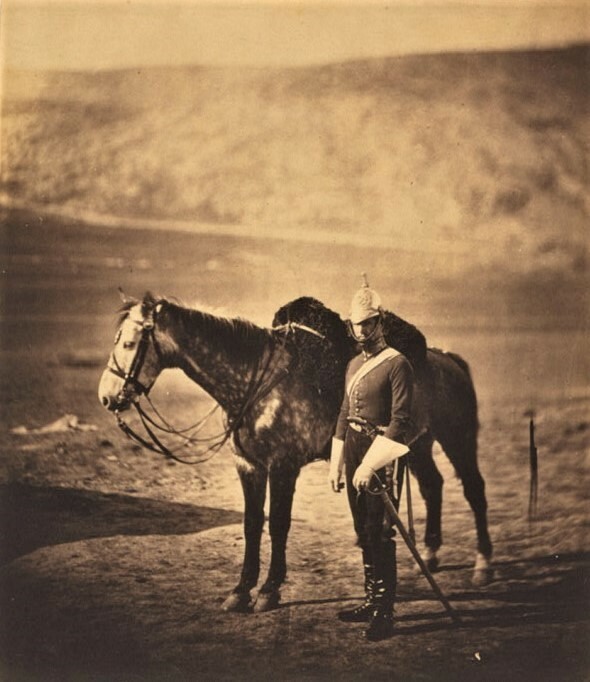 Fenton landed at Balaklava on 8 March 1855 and remained there until 22 June, taking a servant and Mr Marcus Sparling along as his photographic assistant, as well a large horse-drawn van of equipment. Fenton’s van in the Crimea with assistant Marcus Sparling in the driver’s seat. Given the limitations of early photography, images were inevitably limited to posed subjects and keenly avoided depicting the brutal reality of war and its effects. 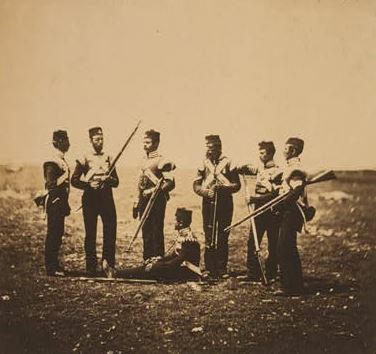 Men of the 68th Regiment photographed by Fenton. Fenton managed to make over 350 images and an exhibition of 312 of them was soon on show in the months that followed. Fenton also showed them to Queen Victoria and Prince Albert and also to Emperor Napoleon III in Paris. 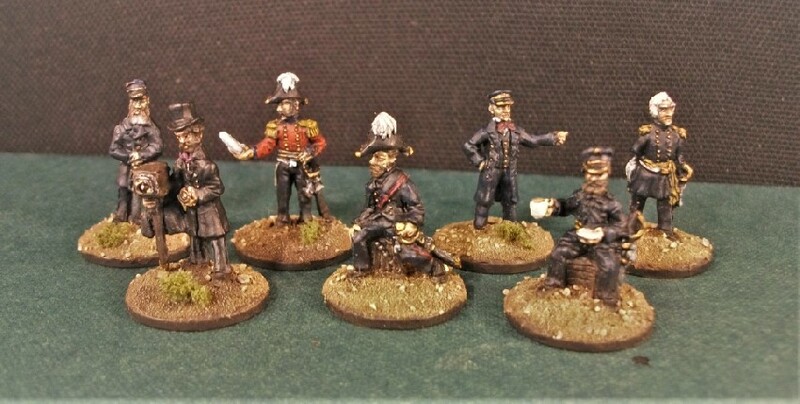 Strelets have pleasingly taken Fenton’s photographs as their inspiration for a number of figures in their Crimean War Big Box set; “Heavy Brigade”. Many of the figures are clearly homages to Fenton’s images and they even include a figure of the photographer himself! You can see how my Roger Fenton turned out. Note his fetching striped trousers seen in the image above have been reproduced in my figure. Sir James Simpson was born in 1792 and was commissioned as ensign and lieutenant in the 1st Foot Guards in 1811. 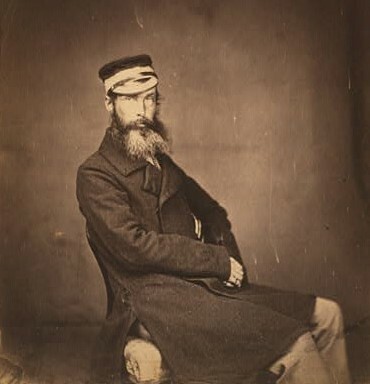 In the following year he was sent to the Peninusular campaign where he was part of Wellington’s army. He served in the 100 Days Waterloo campaign and was severely wounded at Quatre Bras. “the general feeling in the army was that he was ‘a good man, a long-headed Scotchman,’ but hardly equal to so great a responsibility”. 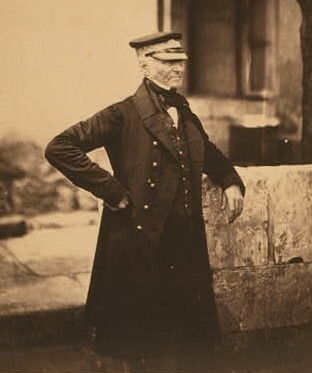 Gen. Simpson by Roger Fenton. On 8 Sept 1855. the final assault was delivered by the French and British on the Russian defences at Sevastopol. But Simpson’s chosen divisions unwisely consisted largely of raw recruits, was poorly executed and supported, and the attack failed. However, the French capture of the Malakhoff redoubt secured success for the allies. In November, Simpson resigned the command which he had initially accepted with some reluctance and retired from the army. 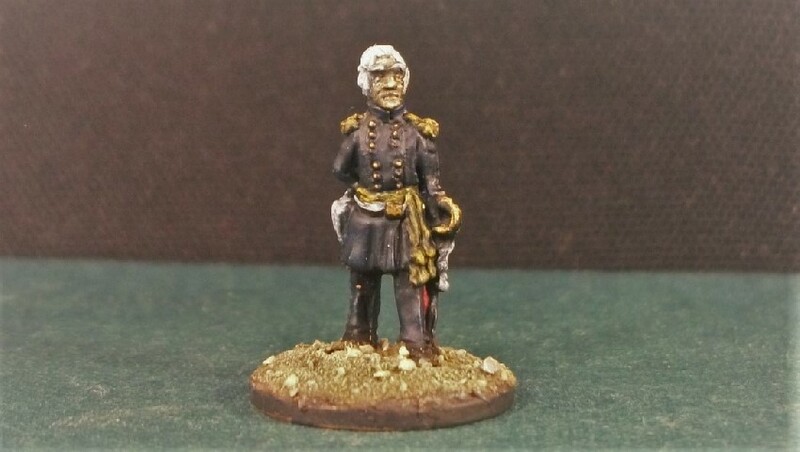 Another Peninsular War veteran, the Scottish George Brown had a brilliant war record until settling into a 25-years long appointment to Staff work at Horse Guards. 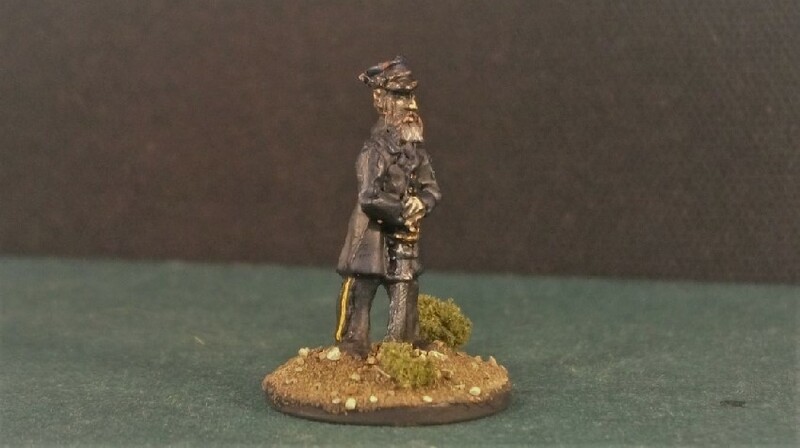 In the Crimea, he commanded the Light Division and was criticised by some for his strict enforcement of camp discipline. 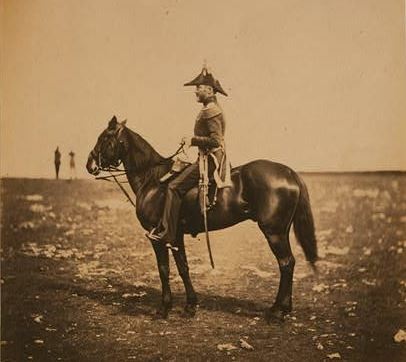 At the Alma, Brown’s horse was shot from underneath him and later he was severely wounded at the battle of Inkerman, curiously while leading French Zouaves. Following his injury, he was invalided home in June 1855, was promoted to general, and became commander in chief in Ireland, dying in 1865. 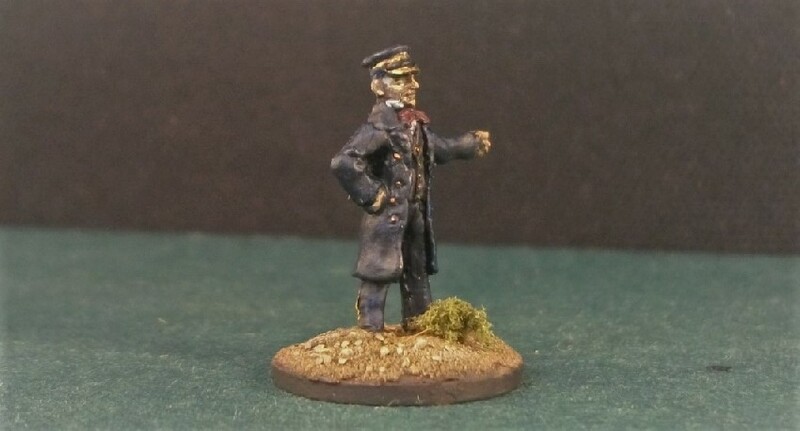 You will note that I’ve painted Brown as he was depicted in Fenton’s excellent photograph – as a 65 year old veteran with a shock of white hair. 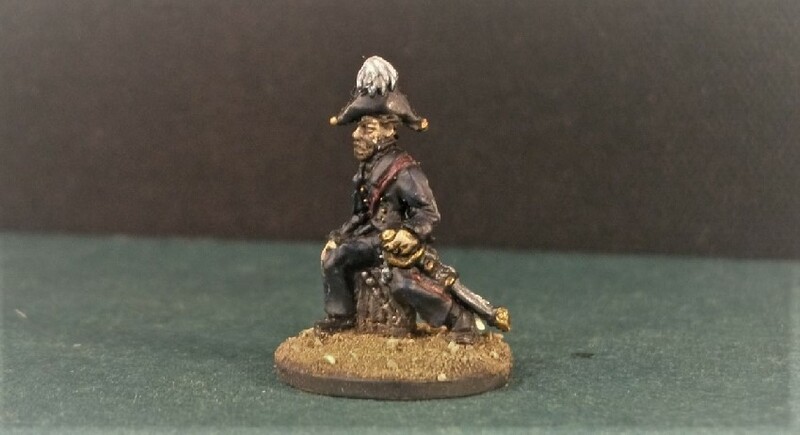 Another scot, Colin Campbell was born Colin Macliver, but for obscure reasons had changed his surname to Campbell by the time he was gazetted as an ensign into the 9th Foot. Like many of his fellow senior officers in the Crimea, Campbell saw action in the Peninsular War where he saw action with Wellington’s army in a number of key battles. As a major-general, Campbell commanded the Highland Brigade at the battle of the Alma. Plastic Soldier Review state that after this early battle, Campbell adopted the Highland bonnet, ditching the bicorn hat shown on my figure. At Balaklava, Campbell’s famous “thin red line” of Highlanders repulsed the Russian cavalry. He was overlooked as Commander in Chief after Simpson resigned, however, and left the Crimea apparently ‘in a huff’. He was appointed to full commander at the outset of the Indian Mutiny, becoming a general and adopting the title Lord Clyde. After the successful conclusion of operations in India, he became Field Marshal in 1862. After his death, he was buried in Westminster. Colin Campbell is depicted awkwardly perched on a crate due to the length of his sword. 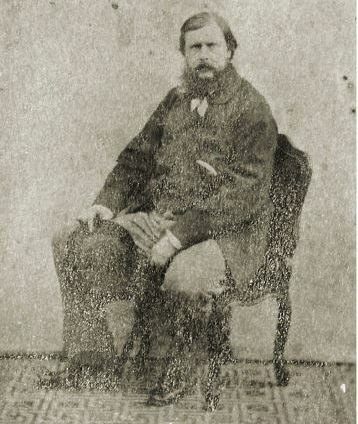 Another Fenton image of the celebrated commander. The son of a general, George Buller began his army career as 2nd Lieutenant with the Rifle Brigade in 1820. 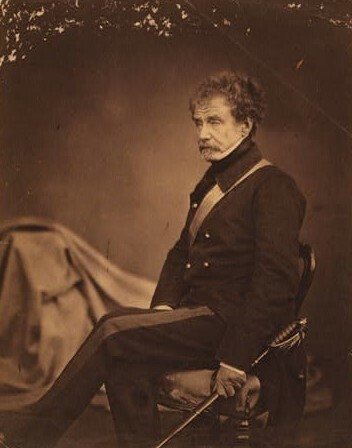 During the subsequent 25 years of peacetime service, his connections aided his rapid rise to Colonel in 1841. He then gained valuable command experience during wars on the South African cape. 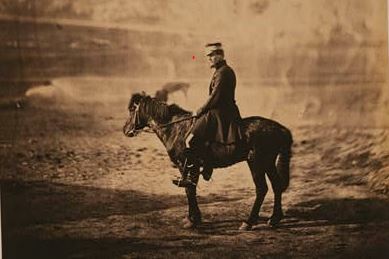 Fenton’s image of George Buller on horseback. As a Brigadier-General, Buller took command of the 2nd brigade of the Light Division in the Crimea where his conduct at the Alma initially attracted some criticism, but was apparently later viewed with approval by military authorities. At the battle of Inkerman he was severely wounded in the left arm and promoted to Major-General before being invalided home in March 1855. 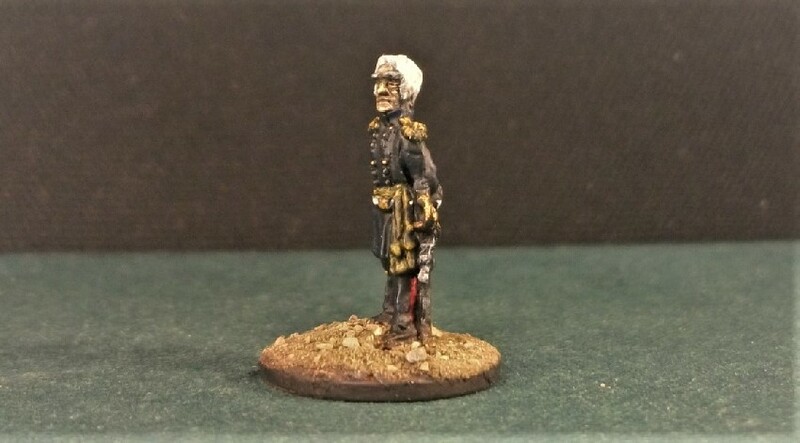 He made full general in 1871 and died at home in 1884 at the age of 82. The son of aristocratic German parents, Prince Edward started his military career in the British army as an Ensign in the 67th Regiment in 1841. By 1854, he held a brevet-majority in the more prestigious Grenadier Guards. 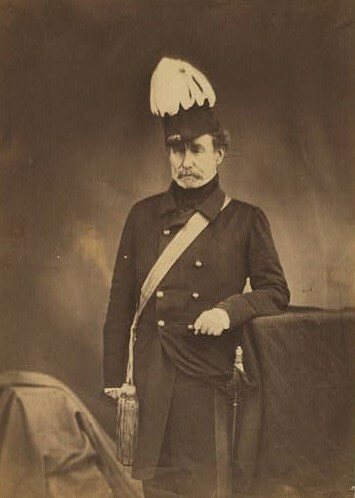 He was present at all the major battles for the British army in the Crimea and was appointed aide-de-camp to the Queen as well as full colonel of the Grenadier Guards by 1855. After the war, he rose to Field Marshal, ‘despite no great military achievements’. Not sure of the photographer, but a great image of the Prince in a sitting position like my figure. Strelets have depicted this German-born, English aristocrat enjoying the most quintessential of English occupations – drinking a cup of tea. The tea cup looks perhaps large enough to be a mug but at least he has a saucer! 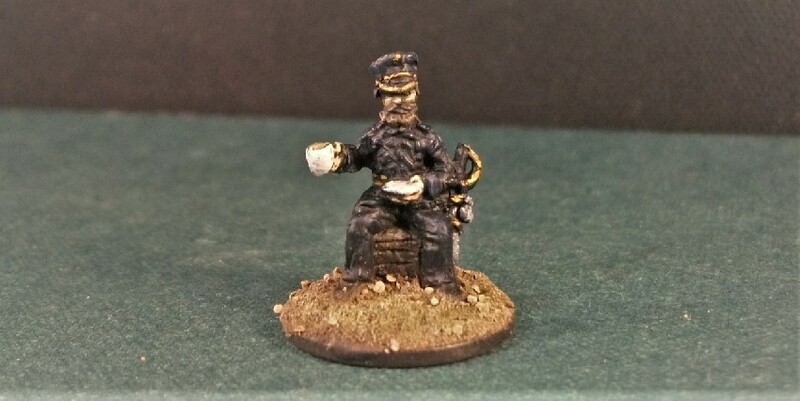 Sitting on a wooden box, I’ve decided that he takes his tea with just a dash of milk, (a little of Vallejo’s Off-White added to the Brown Sand). 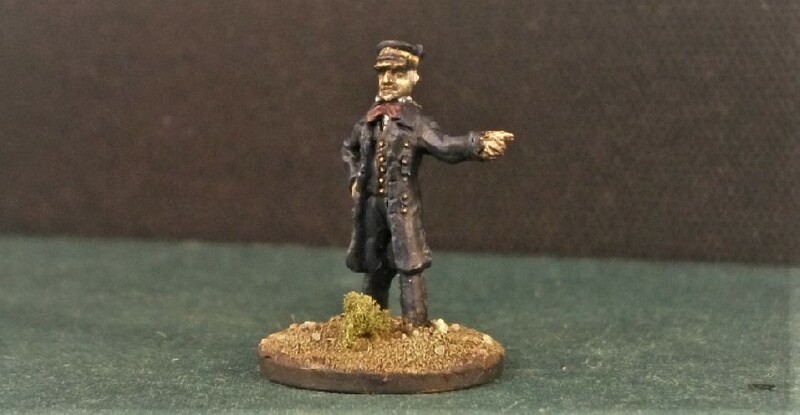 A Fenton image of Captain Halford. 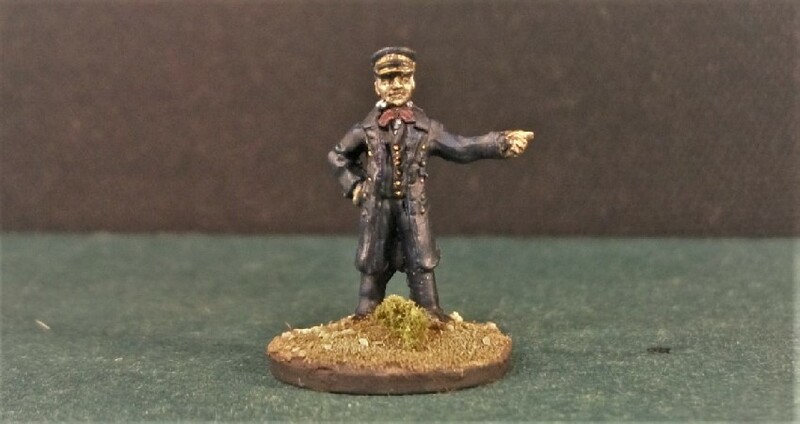 I say being immortalised by Fenton during the Crimean War is a perfect excuse to include the figure! 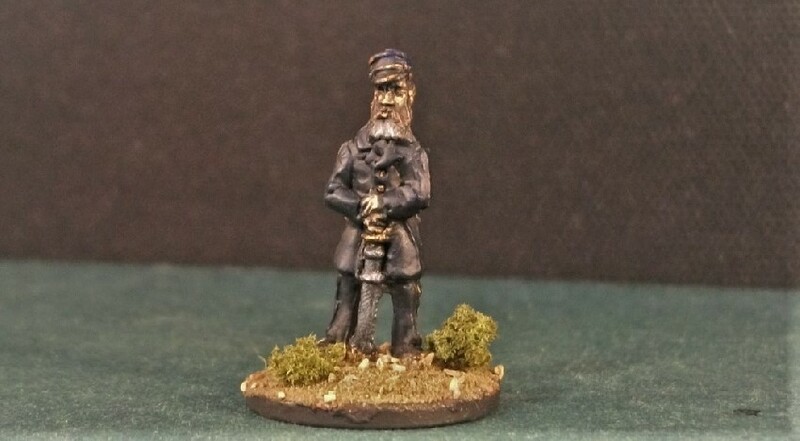 I still need to paint the band across his cap gold and I now also wonder if some light grey trousers might reference his portrait better, but at least I’ve faithfully reproduced his greying beard? As PSR indicated, Fenton took a number of images of Halford, including some in military attire – dressed as an officer of the 5th Dragoon Guards. Below he is in a full dress uniform standing with a dappled grey. 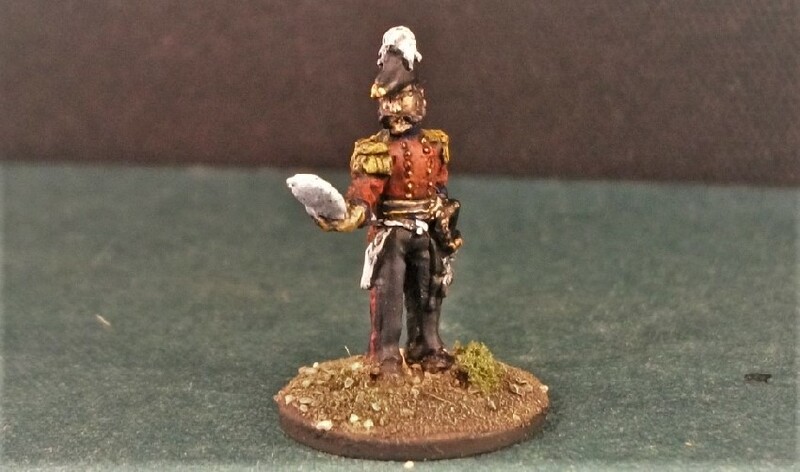 Another image shows Halford with a different horse and wearing his undress uniform. There’s a whole bunch of other Crimean character figures to tackle, so who knows, I may even paint some more? You’ve really brought these old soldiers, from this little known war, back to life. Thanks Pete! 🙂 Have really enjoyed the challenge. 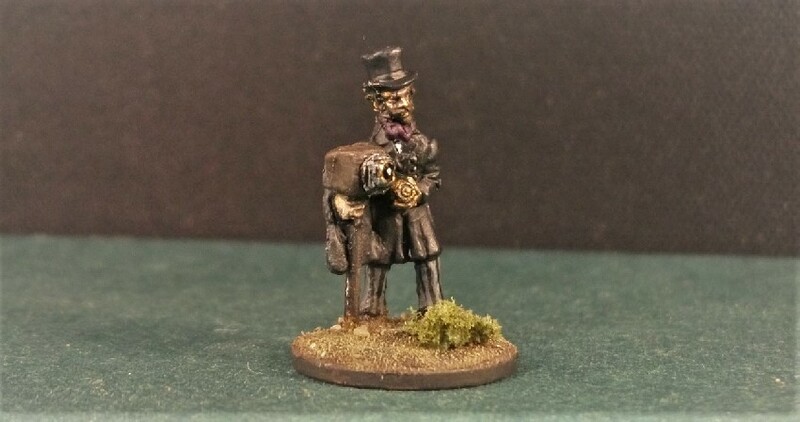 Really interesting mate and well painted . Cheers, pal. I think some of them do have a passing resemblance to the originals. 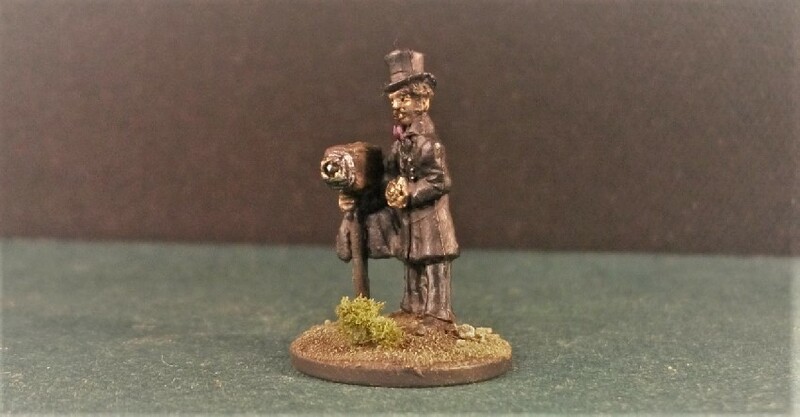 An unusual and useful command set, beustifully painted – I especially like the Roger Fenton figure. Thanks! 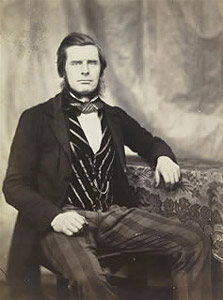 I thought Roger Fenton is a really nice inclusion. 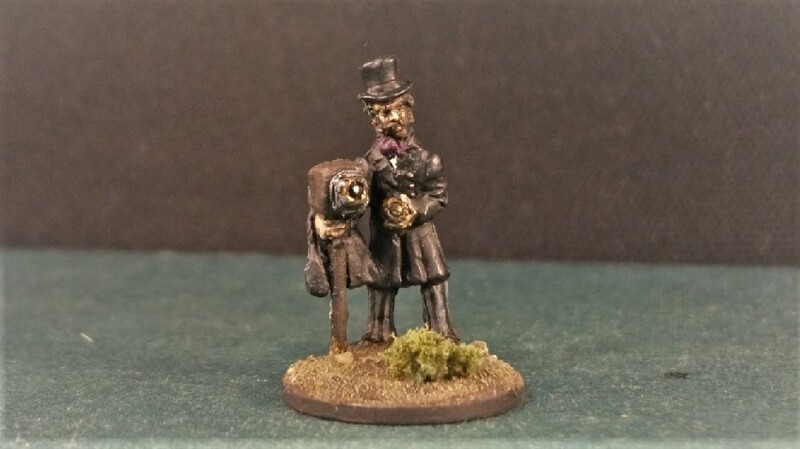 It’s a figure that could be used in any number of Victorian dioramas.